Pathik works for an auditing firm. The nature of his job involves managing numerous clients, tasks, documents, notes and audits throughout the day. 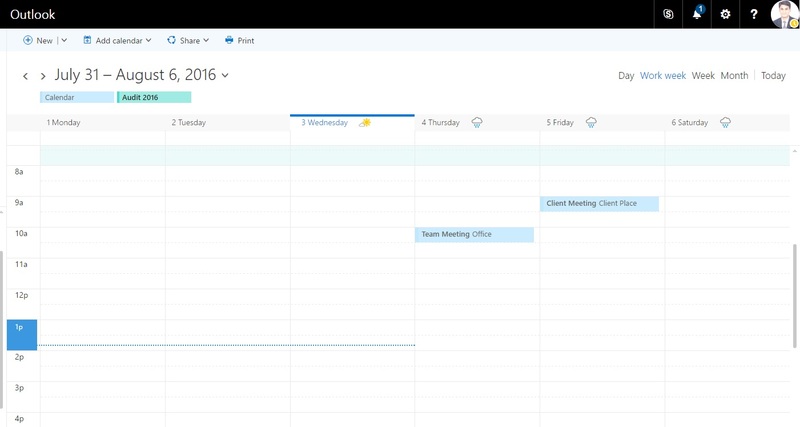 Microsoft Planner offers him a simple and visual way to manage audit work. Planner is highly versatile, making it easy for him and his team to create new plans, organize and assign tasks, share files, chat about what he is working on, and get updates on progress. The planner hub view provides a visual all-up view of the audits that Pathik is currently working on. As Pathik is currently working on Audit 2016 plan, he thinks it’s correct to move it from All plans section to Favorite plans. Yellow represents tasks not yet started, blue represents tasks in-progress, late tasks are red and completed tasks are green. From the Hub itself he creates a new plan for the audit work he is about to start. He has an option to decide the privacy of the plan, whether assign it public or private settings. Planner automatically creates an email account for the already created plan. Pathik also has an option to have planner send notifications about task assignment and task completion to the plan’s conversation feed. The main value of Planner is that it helps teams organize their work intuitively and visually. Each plan has its own board, where Pathik can see a detailed view of tasks and team members. Within the board, a card containing due dates, documents, categories and conversations represents each work item or task. 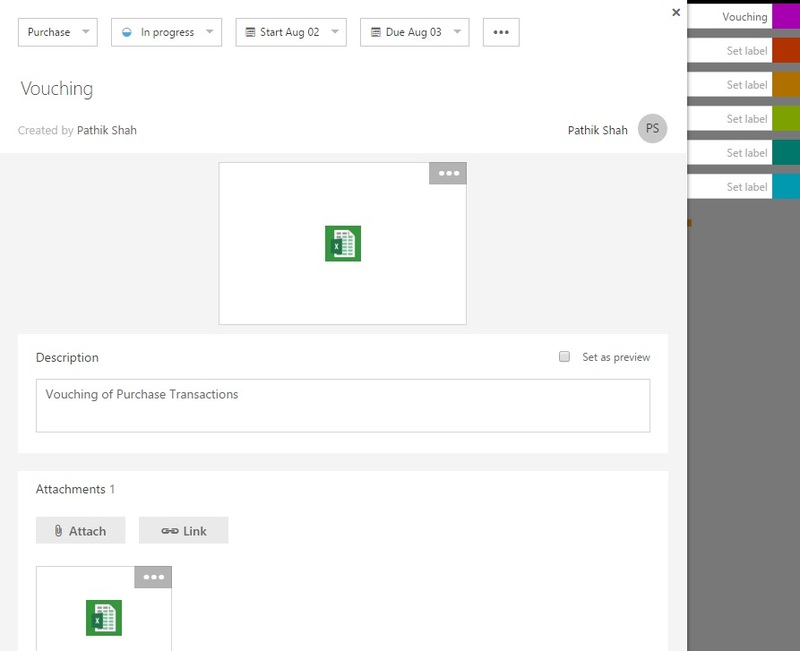 Pathik can add team members to the plan by using the pull-down menu available at the top right and typing the name of the auditor he wants to add. 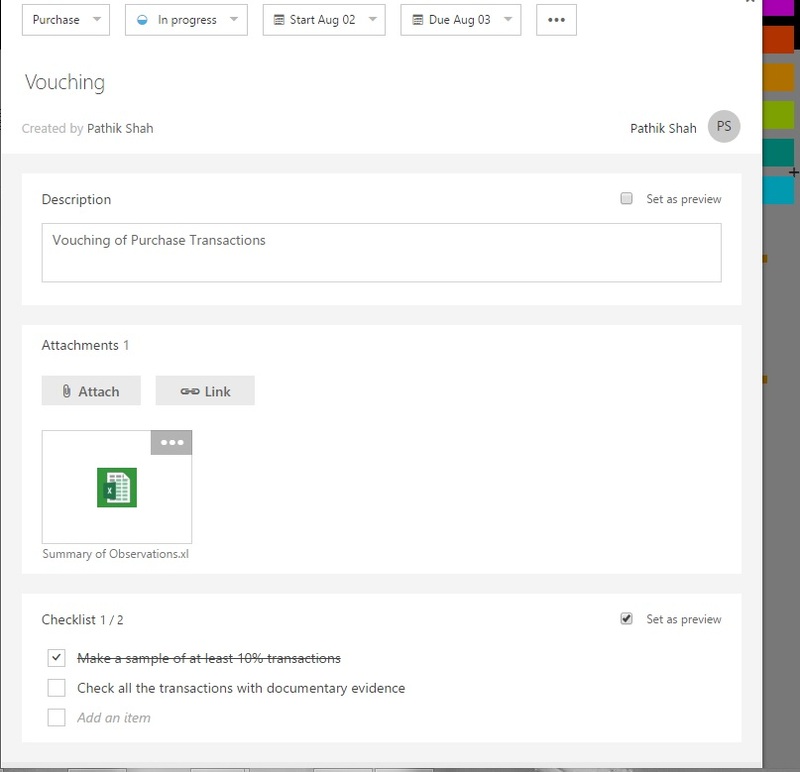 As Pathik is currently working on vouching of purchase transactions, he opens the vouching card and attaches his audit working papers to the card. The following image shows his summary of observations attached as an Excel file. He has an option to set items in card to be set as preview. This helps him understand the content and context of the card. His audit team members can easily find and edit or co-author the audit observations excel file. Further, Pathik has an option to add comments to the card for his and others’ easy reference. Pathik can also assign a colored tag to the card to make it look different from other cards. Say all vouching related cards carry a purple tag. Pathik can organize cards on the board into customizable columns called buckets. He and his Audit team uses buckets to reflect various types of work they do for an audit. Currently, Pathik has added two buckets viz., purchase and sales. The ability to group tasks this way gives Pathik a great deal of flexibility. Audit work items To do are then moved to appropriate buckets by dragging and dropping. Further tasks can also be assigned or re-assigned by dragging and dropping members from the top right pull-down menu. Buckets may be deleted anytime but that will also delete the tasks associated with the buckets. Pathik can also group cards by task assignment. This gives a quick view of how many tasks each team member is responsible for, and enables Pathik to spot potential imbalances in work assignments. My Tasks View makes it easy for Pathik to focus on his own tasks. He can group his tasks either by Plan or Progress. This view also enables Pathik to change the status of tasks by simply dragging tasks from Not Started column to the In Progress column. He can mark a task complete by clicking the check box. Plans have two basic views: Board and Charts. The Charts view gives Pathik a rich visual representation of the overall progress and the workload distribution between the team members. This helps him identify and resolve key issues in order to keep the team on track. In order to highlight the status that Pathik wants to focus on, he clicks the various states below the graphic. This in turn refreshes the Tasks list at the right. As seen previously, most of the tasks are either not started or in progress, as expected for a relatively new audit. However, the project has some late tasks, which Pathik needs to address. In the members section in the Charts View, Pathik can see the workload of each auditor. Planner is part of Office 365, so all infrastructure for emailing, conversations, and notification handling is already in place. An Office 365 Group is automatically created when someone creates a new Plan. Conversely, a Plan is also created when someone creates a new Group. Because each Plan is associated with a Group, all conversations in Planner are also available in Outlook 2016, Outlook on the Web, and the Outlook Groups Mobile Apps. Team members can stay on top of their Plans and tasks, wherever and whenever they work. When Pathik opens Conversations in the Audit 2016 Plan, the Group conversation opens in Outlook on the Web. Subscribing to Group conversations is an option that each team member can set independently. Once subscribed, they will receive notifications in their Outlook inbox whenever they are assigned a new task, added to a conversation, or if events are scheduled. Another powerful feature of Planner is OneNote integration. Every plan has a OneNote notebook attached, making it easy for auditors to share, record, and express ideas, audit queries and observations with each other in a central location. Every Plan comes with a shared calendar that all team members can access and to which they can contribute. Working with a Planner calendar is the same experience as working with a Group calendar. Every user can select which calendar(s) to display in his or her own view. Planner is an ideal way to organize and work with Office files. Pathik can attach his audit working papers to a Card and start editing them right away. When a document is attached to a Card, it is stored in the Files area of the Plan, allowing members to edit them collaboratively (co-authoring) or to work on them offline. Planner takes the chaos out of teamwork and get more done. Planner makes it easy for auditors to create new plans, organize and assign tasks, share files and chat about what they are working on, and get updates on progress.